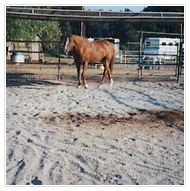 For many years, we have heard about people using both "drop-out" perlite and regular perlite in horse stalls and corrals. "Drop-out" perlite is perlite which didn't have enough moisture in it during processing to expand properly - and so it didn't expand, or it didn't expand enough. As a result, these heavier, large perlite particles "drop-out" of our furnaces. Regular perlite also has been used by people who want something to soak up more moisture, or provide more drainage in both corrals and stalls. After many years of hearing about this unusual use of perlite, we finally got some pictures of this "unusual and unexpected" use. Apparently, the perlite is simply spread on the ground "as is" providing less compaction and more drainage. 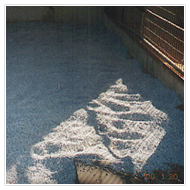 "Regular" perlite has been used in animal stalls. They soak up moisture and can be handled far easier than many other products.